A global oil and gas company is using offshore technology expertise developed on the Norwegian Continental Shelf and applying these state-of-the-art processes to its Brazilian oil fields. The company can produce over 90,000 barrels of oil a day and has reserves of 300- 600 million barrels from the Campos basin. ABB has played an important role in helping company managers maintain these production goals and is providing local resources to help maintain production levels. The company is well-established in Brazil, where they operate the largest oil field outside of Norway and operate in one of the most complex fields in the Campos basin, producing the heaviest oils in Brazil. The heavy oil found in this Brazilian oil reservoir is perhaps the greatest challenge that company managers face. The oil viscosity is so thick that it must be treated before it will flow. The reservoir is located about 2,300 meters (approx. 7,590 feet) beneath the seabed. Each production well is artificially lifted using electric submersible pumps to bring the oil up from the reservoir to the wellhead platforms. The intricate process of recovering the oil from the offshore reservoir and heating it in the separation unit and storage tanks requires vast amounts of electric power. To generate this energy and store the pumped oil, the company had a floating production vessel constructed in 2010. The Floating Production Storage and Off-loading (FPSO) can produce 72 megawatts of electricity, or enough to power 150,000 Brazilian households, and has a storage capacity of 1.6 million barrels of oil. On a global level, ABB is engaged with the company in a joint industry project to develop power and automation for offshore factories. The five-year program is centered on the development of technologies required to power and control large-scale offshore pumping and gas-compression projects. Offshore pumping and gas compression contribute to improved utilization of oil and gas resources through greater recovery rates, reduced production costs and the further development of deep-water production. The ABB solution for the FPSO and wellhead platforms distributes power for the entire production process, including the electric submersible pumps in the production wells below the seabed. For the oil to flow between the platforms and the FPSO, it is heated in the flow lines. The two wellhead platforms transfer the produced liquids from the wells to the FPSO, moored in the middle. There are 30 horizontal production wells and seven water injection wells, which are connected to two drilling and wellhead platforms located about 10 kilometers (6 miles) apart. 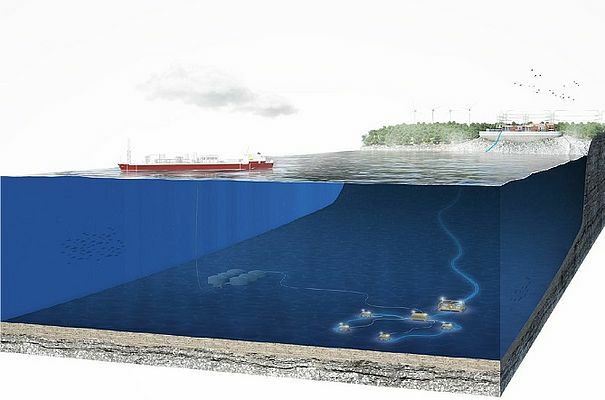 The platforms are connected to a FPSO with flowlines and power umbilical. ABB supplies a multisystem automation solution, including field instrumentation and telecommunications systems. The solution includes a process control system, power management system, production information management system, fire and gas system, and emergency shut-down system. The FPSO’s system is operated from an ABB System 800xA Extended Operator Workplace (EOW-x) control room onboard the FPSO. EOW-x offers an ergonomic operator environment that facilitates operator decision-making and produces measurable improvements in plant productivity, safety, information flow, and operator job satisfaction. Some 14,000 integrated operations on the vessel and platforms are controlled by ABB AC 800M process controllers and AC 800M high-integrity controllers. The solution also includes an 800xA Simulator, which contains adapted versions of all the site automation systems and connects them to a dynamic process flow model. The simulator provides realistic and safe process simulation for operator training. It enables engineering, testing, startup, optimization studies, and upgrading to be performed and mastered in the simulator prior to execution in the field. Thousands of hours of work are performed each year for the company by over 200 ABB specialists at remote centers worldwide, thereby reducing the need for this customer to deploy its own expertise at the sites. If an incident occurs, ABB has all the required skills to work on a solution immediately and implement it remotely. During the original project delivery phase, protection relays were connected via Modbus which offered very limited diagnostic capability. Low-level diagnostics and non-enough data were not helping the company to efficiently operate and quickly troubleshoot the platform’s electrical system. Today’s IEC-connected protection relays offer much improved networking and diagnostic capabilities. To improve integration between the electrification and automation systems and provide long-term operational support for the electrical equipment on the oil field ABB proposed a protection upgrade and 800xA integration project package. The project consisted of scoping, planning and assembling the Global Positioning System (GPS) switches, fiber optic networking, and modifications needed to achieve the objective of electrical time synchronization for the FPSO, and well head platforms. The project consisted of an electrical system upgrade with focus on the lifecycle of ABB protection relays and IEC618501 integration synchronized by the GPS. ABB supplies medium voltage protection relays for modernization of the electric power system using IEC61850 protocol on the two fixed platforms and the FPSO. This modernization, which provides clock synchronization, enables fast identification of the root cause of any system failure. To complete this project, a team of approximately 40 ABB electrical telecommunications and automation professionals were on board to execute the project. ABB faced two critical challenges: avoiding an extended maintenance shutdown, and not harming production while operating under a very tight timeframe. The task of these professionals was to integrate the relay to System 800xA, to ensure synchronization between the functioning of product and the progress of activities on the platform. After the automation upgrade on the oil field was completed, ABB showed the real benefits of a high level of integration between electrification and automation systems, and how it could support company operators.